“There are Brewer’s Sparrows along the Nature Trail,” Bernie mentioned after Rebecca had reviewed the game-plan for Bitter Lake NWR, the first stop of the 24 hour Birdathon for the 20 assembled participants. The donations from the participants and their friends this year will go to purchase educational signs along the trail that borders the popular Doc Long Picnic Area to provide information to visitors about the birds and the habitat that supports them. “We’d better start with the Nature Trail then,” Rebecca, our Birdathon trip leader, replied – and the group set out on foot. It was 10:03, our official start time. The Brewer’s Sparrows were giving their buzzy calls, then popped up and flew across the trail. Since we wanted to make sure that everyone saw and ID’d them, we paused until everyone had a chance to focus their binoculars as they bounced in and out of the scrub. Western Wood-Pewee, Chipping and Lark Sparrows, and next to the refuge residences, the only House Sparrow of the trip. As we returned to the cars, a Wilson’s Warbler flitted in a small tree. We drove to the road that crosses the refuge and stopped at a pullout where we could scan a large wetland where there was a variety of ducks. As we drove south along the eastern refuge road, Western Meadowlarks were singing. Joe spotted a Sora swimming. We stopped and at least half of the group were able to spot it before it scooted back under the overhanging shrubs. Further south there were both Cinnamon and Blue-winged Teals, Ruddy Ducks and an Earned Grebe. A male Northern Harrier cruised low over the wetland. White-faced Ibis seemed to be everywhere. At the south end we parked and walked a short ways to an area that is good for shorebirds. While there were not as many as we had hoped, there were Least Sandpipers and a Spotted Sandpiper. We got out of our cars and set up the scopes halfway along the south refuge road. and Black-necked Stilts seemed to dance in the shallow water. Snowy Egrets searched for crustaceans and Long-billed Dowitchers in breeding plumage probed in their sewing machine fashion. While many Wilson’s Phalaropes, both males and females, were doing their characteristic spinning, a couple of them were acting like the shorebirds they are, by walking along the shore and probing in the mud. “There’s a Willet,” someone said. As it flew a short distance, its black and white underwing pattern flashed. “The juvenile raccoon is still here,” Rebecca pointed. It was along the edge of a pond edge near where Snowy Plovers were foraging. Along the far edge was a Ross’s Goose that decided it couldn’t make the trip north. We added Northern Shovelers, Gadwalls and a Redhead. While we ate lunch at the tables on the Visitor Center deck overlooking the refuge, Barn Swallows were busy building nests above us. Everyone got up to catch a glimpse of a Swainson’s Hawk and to look at Blue Grosbeak that landed in a nearby tree. We had a good start on our list. We followed Rebecca as she took us along the back roads of eastern Roswell through agricultural areas to avoid the stoplights in town. We were able to add American Kestrel along the route. Cars began assembling at Rattlesnake Springs around 3:40. While we waited for everyone to arrive, we enjoyed watching some of the many Vermilion Flycatchers. “I want us to walk along the area next to the bushes,” Rebecca stated when everyone had arrived. We want to make sure that everyone has the opportunity to see the little birds that we will encounter. One of the first ones we heard was a Bell’s Vireo. Rebecca pointed out the song to those who were not familiar with it. I am so used to birding by ear that I would have normally not waited for one to show itself. One of the positive things about this year’s Birdathon rules was the requirement that at least half of those present needed to see every species we put on our official bird list. While it slowed us down, it was a wonderful opportunity for less-experienced birders to really get good looks a birds that were new to them. After gathering around the Bell’s Vireo bush, it finally showed itself long enough for everyone to get a good view. as well as an Indigo Bunting. In the deep cover of some small trees, there were two Hermit Thrushes. Joe, who had scouted with Rebecca, pointed out a female Vermillion Flycatcher sitting on her nest. 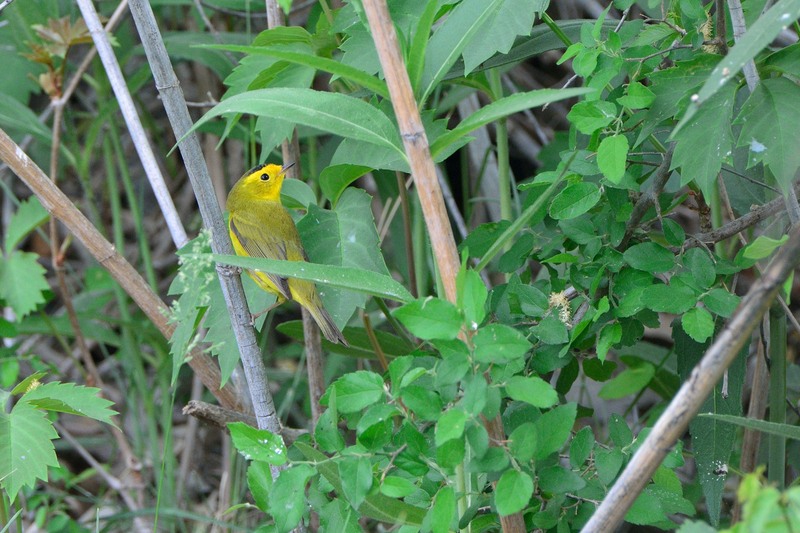 At the far west side of the oasis, we picked up Yellow Warbler and the first of many Summer Tanagers. Deep in the bushes along the creek near the pond, we added Cassin’s Kingbird, Pine Siskin, Yellow-breasted Chat and American Goldfinch. A Black-chinned Hummingbird landed in a nearby tree. As early evening approached, the swallows became more prolific. As we walked back to the picnic area, a few of us stopped to admire a female Orchard Oriole. “A life bird!” Deanna exclaimed. Rebecca had put plastic table cloths on three tables, along with some beverages, to make our picnic dinner more festive. 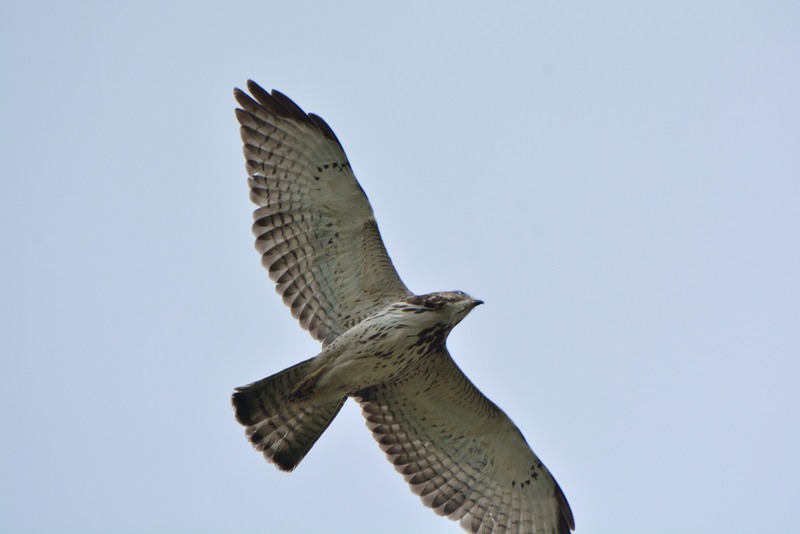 As we were eating, folks sitting along one side of the three tables were able to see a Gray Hawk as it soared by. Rebecca and Joe had flushed one from the woods the day before and Joe got a wonderful photo. As the group began taking their coolers back to the cars, someone spotted a male Orchard Oriole. Everyone else rushed over to get a look. Joe, our ‘owl whisperer’ had talked with a National Park staff person who had told him about a Great Horned Owl nesting location nearby. He and Rebecca asked Barb and me if we wanted to go check it out. The owlets were supposed to be easily visible in a tree across from the entrance to the Black River Recreation Area. Barb, who was standing at just the right angle, was the one who spotted the three owlets huddled together at the junction of two main branches of a dead cottonwood. If they didn’t move, everyone would be able to see them in the morning on our way to Slaughter Canyon. Before we headed back to our motel in White’s City, Barb and I stopped to watch a ‘posse’ of 35 Wild Turkeys in an empty field. In the ‘golden hour’ light, the iridescence of their feathers seemed to shimmer. The caravan of cars was ready to leave the motel at 6:30 am the following morning. We used the two-way radios so Rebecca could alert everyone about birds that they would be passing, so everyone would be sure and see them. 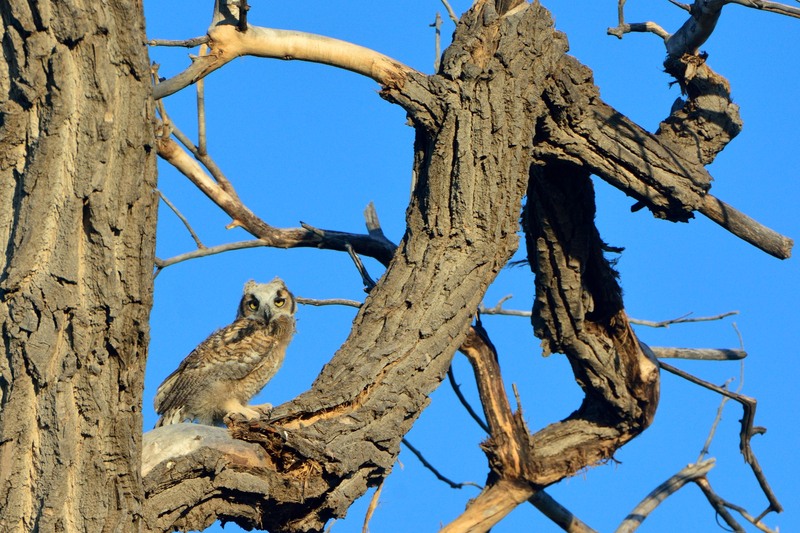 Our first stop was under the tree with the owlets, who had separated during the night and were perched on different limbs. The Turkey Vultures were already up and foraging for carrion. A Swainson’s Hawk was perched on a fence post. As we passed a farm, a sprinkler was spewing water on an empty field that was attracting Killdeer and Lark Sparrows. As we got out of our cars in the parking lot at Slaughter Canyon, the wind seemed to increase in velocity, and as we started picking our way over the river rock trail, the canyon acted as a wind tunnel. We hadn’t gone far when someone spotted a Scott’s Oriole. People had to yell at each other to be heard over the wind as they gave information about the oriole’s location to those further back in line. When we had birded this canyon two years prior in calm weather, we were able to observe Varied Bunting and Gray Vireo. They must have been hunkered down this morning. We did add Western Tanager, Green-tailed Towhee, Lazuli Bunting and Lark Bunting to our list. To give us enough time at Washington Ranch before our 10 am ending time, we couldn’t tarry. So picked our way back to our cars. As we were leaving, there was a Canyon Towhee near the entrance of the parking lot and on the way back we added Brown-headed Cowbird, Eastern Phoebe, and Scaled Quail. There was a row of Fruited Mulberry trees that lined the edge of the parking lot at Washington Ranch. There was so much bird activity it was hard to know which tree to look at first. “Painted Bunting,” someone called. We all rushed over and jockeyed to see the stunning red, blue and lime-green male. Among the many Pine Siskins, Lesser Goldfinches and House Finches were at least one pair of Cassin’s Finches. Wild Turkeys were clucking loudly at each other on the ridge behind the trees. In and around the ponds we added a female Ring-necked Duck and Black Phoebe. We circled the main building and were walking along a path under a row of trees where the Wild Turkeys evidently roos, when Ed called out “Zone-tailed Hawk,” as it disappeared over the building. Only a few were able to look up in time. Fortunately, it circled back, giving the rest of us an opportunity to see the band on its tail. As we walked up the hill towards the stone cabins, there were Blue Grosbeaks in the grass and a Bullock’s Oriole on the window sill of a cabin. The neck ruff of a male was flared as he sat in a juniper tree. His red eye was clearly visible. 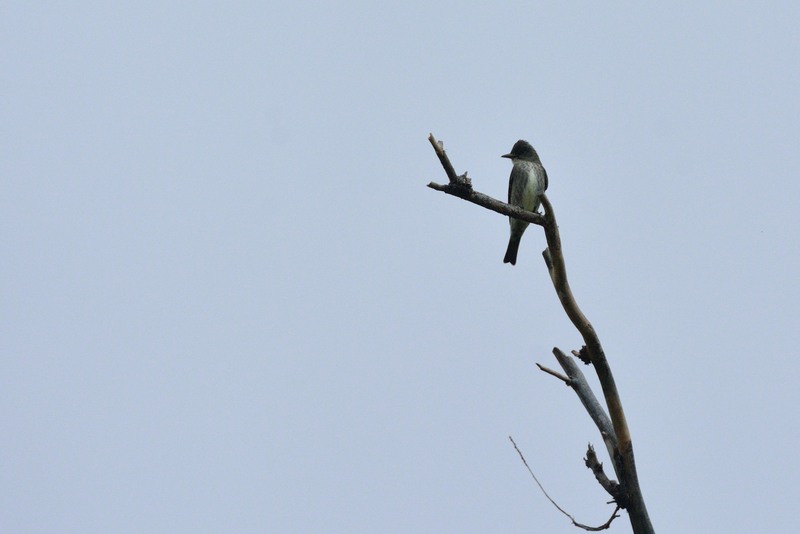 When we returned to the pond area, there were multiple species of swallows, as well as White-throated Swifts which were not flying along the cliffs in Slaughter Canyon earlier that morning. A Cedar Waxwing was spotted in the Fruited Mulberries. And then it was 10:03 and we had to stop our official count and go over the checklist – 103 species. Some of us had a hard time stopping. A local birder had stopped at Washington Ranch to show us his picture of a Hooded Warbler at Rattlesnake Springs. Sure enough it was on my phone, along with directions. A group of us drove back over to Rattlesnake Springs and started searching along the creek. As Barb and I stood in one location we saw Swainson’s Thrush, Northern Cardinal and Rose-breasted Grosbeak – all species we had not seen on the Birdathon. I heard Bernie call, and we weaved our way through the trees to where he and Pauline had briefly seen the Hooded Warbler. Three others joined us. As we waited, it tentatively emerged from the water plants – and we all had good views. “Chestnut-sided Warbler,” said Pauline who had recently moved from the east coast where it breeds and was familiar with its behavior. It perched in a location along the edge of the trees where everyone could see it. Barb and I reluctantly headed back to our car. We had a four and a half hour drive ahead of us. It had been a successful 24 hours plus of birding in many ways. One participant who has not been birding long told me she had the opportunity to see 10 new life birds. The camaraderie of the group working together was rewarding – and hopefully, we will raise enough funds for the educational signs. What a wonderful time you had. Lots of great stuff. I’m so sorry to have missed it. I had planned on going but my dad just passed away and I’m helping my mom right now. Maybe next year!